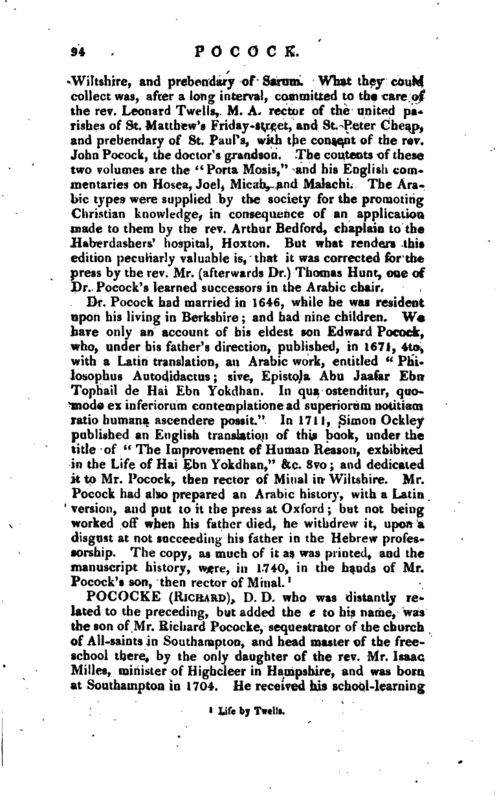 , D. D. who was distantly related to the preceding, but added the e to his name, was the son of Mr. Richard Pococke, sequestrator of the. church of All-saints in Southampton, and head master of the freeschool there, by the only daughter of the rev. Mr. Isaac Milles, minister of Highcleer in Hampshire, and was born at Southampton in 1704. He received his scbool-learning | there, and his academical education at Corpns-Christi college, Oxford, where he took his degree of LL. B. May 5, 1731 and that of LL. D. (being then precentor of Lismore) June 28, 1733 together with Dr. Seeker, then rector of St. James’s, and afterwards archbishop of Canterbury. He began his travels into the East in 1737, and returned in 1742, and was made precentor of Waterford in 1744. In 1743, he published the first part of those travels, under the title of “A Description of the East, and of some other Countries, vol. I. Observations on Egypt.” In 1744 he was made precentor of Waterford, and in 1745 he printed the second volume under the same title, “Observations on Palestine, or the Holy Land, Syria, Mesopotamia, Cyprus, and Candia,” which he dedicated to the earl of Chesterfield, then made lord-lieutenant of Ireland attended his lordship thither as one of his domestic chaplains, and was soon after appointed by his lordship archdeacon of Dublin. In March 1756, he was promoted by the duke of Devonshire (then lord-lieutenant) to the bishopric of Ossory, vacant by the death of Dr. Edward Maurice. 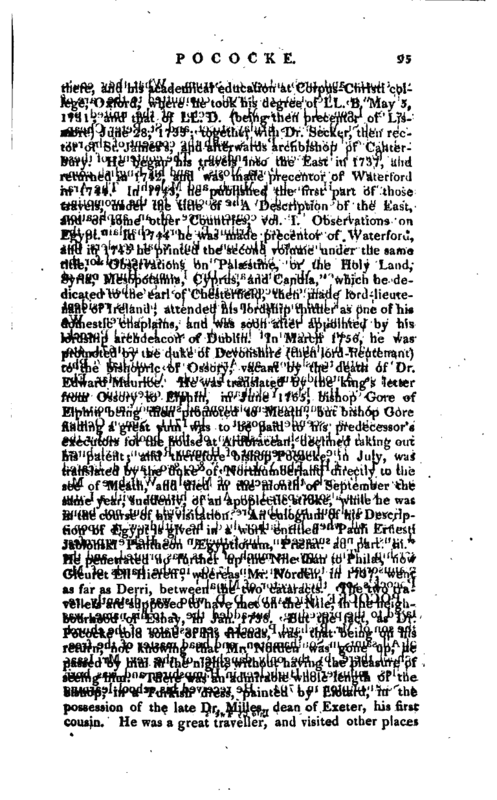 He was translated by the king’s letter from Ossory to Elphin, in June 1765, bishop Gore of Elphin bc’ing then promoted to Meath; but bishop Gore finding a great sum was to be paid to his predecessor’s executors for the house at Ardbracean, declined taking out his patent; and therefore bishop Pococke, in July, was translated by the duke of Northumberland directly to the see of Meath, and died in the month of September the same year, suddenly, of an apoplectic stroke, while he was in the course of his visitation. 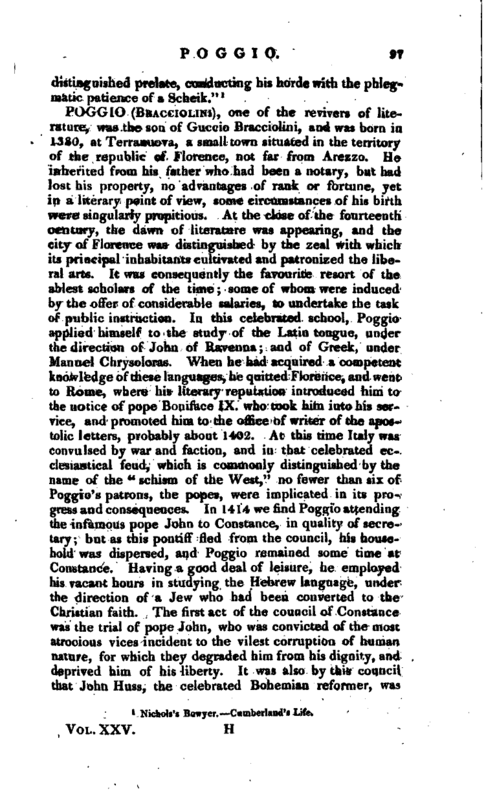 An eulogium of his Description of Egypt is given in a work entitled “Pauli Ernestt Jablonski Pantheon Ægyptiorum, Praetat. ad part, iii.” He penetrated no further up the Nile than to Philse, now Gieuret Ell Hiereff; whereas Mr. Norden, in 1737, went as far as Derri, between the two cataracts. The two travellers are supposed to have met on the Nile, in the neighbourhood of Esnay, in Jan. 1738. But the fact, as Dr. Pococke told some of his friends, was, that being on his return, not knowing that Mr. Norden was gone up, he passed by him in the night, without having the pleasure of seeing him. There was an admirable whole length of the bishop, in a Turkish dress, painted by Liotard, in the possession of the late Dr. Milles, dean of Exeter, his first cousin. He was a great traveller, and visited other places | besides the East His description of a rock on the westside of Dunbar harbour in Scotland, resembling the GiantsCauseway, is in the Philos. Trans, vol. LII. art. 17; and in Archaeologia,vol. II. 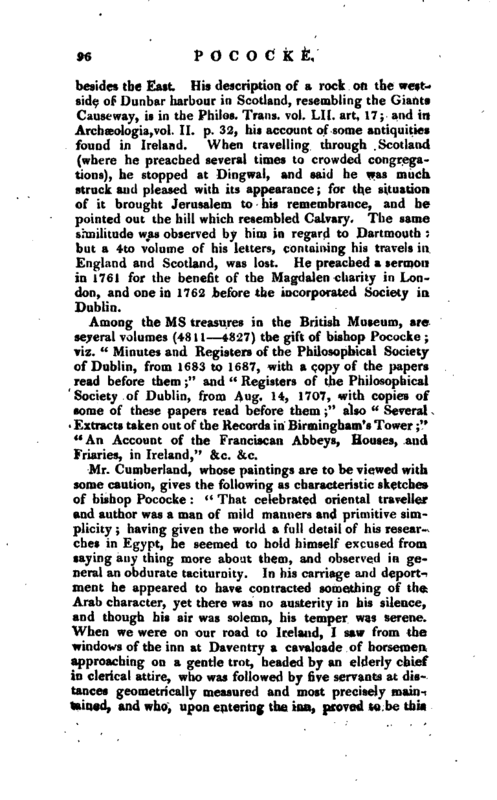 p. 32, his account of some antiquities found in Ireland. When travelling through Scotland (where he preached several times to crowded congregations), he stopped at Dingwal, and said he was much struck and pleased with its appearance for the situation of it brought Jerusalem to his remembrance, and he pointed out the hill which resembled Calvary. The same similitude was observed by him in regard to Dartmouth but a 4to volume of his letters, containing his travels ia England and Scotland, was lost. He preached a sermon in 1761 for the benefit of the Magdalen charity in London, and one in 1762 before the incorporated Society in Dublin. Among the ms treasures in the British Museum, are several volumes (4811 48.27) the gift of bishop Pococke viz. “Minutes and Registers of the Philosophical Society of Dublin, from 1683 to 1687, with a copy of the papers read before them;” and “Registers of the Philosophical Society of Dublin, from Aug. 14, 1707, with copies of some of these papers read before them” also “Several Extracts taken out of the Records in Birmingham’s Tower,” “An Account of the Franciscan Abbeys, Houses, and Friaries, in Ireland,” &c. &c.
1 Nichols’s Bowyer. Cumberland’s Life.